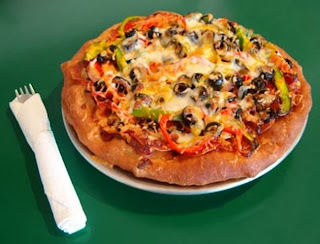 Navajo Pizza photo from Twin Rocks Cafe website. Have you ever seen Navajo Pizza? Twin Rocks Cafe in Bluff, Utah, says it invented the Navajo Pizza using traditional Native American frybread topped with homemade sauce and traditional pizza toppings. 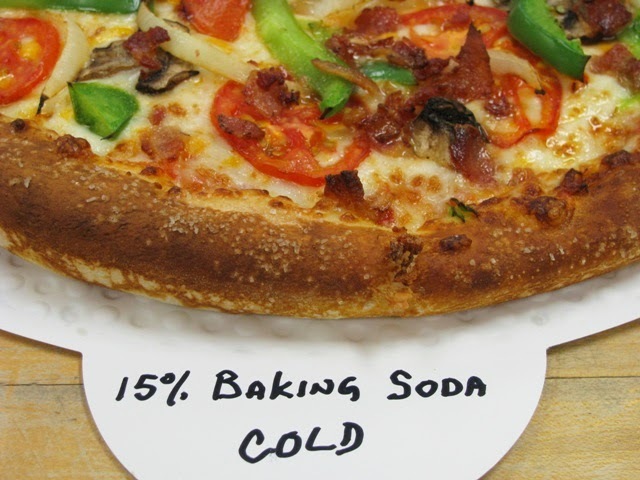 It can be found in pizzerias throughout Utah, New Mexico, Colorado and Arizona. 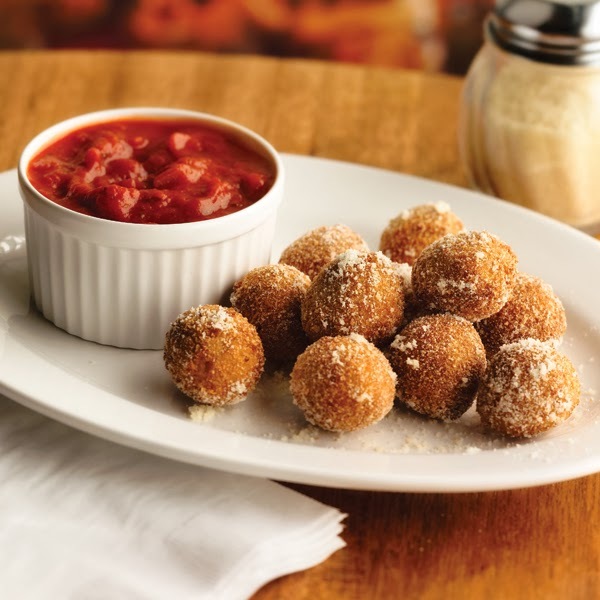 This pizza reminds me of the Italian Montanara, with its fried Neapolitan dough. I haven't had the Navajo Pizza, but I've had frybread before, and can imagine how tasty it would be topped with some marinara and mozzarella. What's your take? Could this be the next style to take off across the country? I was looking through the PMQ Recipe Bank the other day and came across some recipes that I wanted to share with you. Take a look at the list below and let me know if you've tried any of them or will be experimenting any time soon. There are nearly 200 more recipes inside the Recipe Bank, so next time you need a little inspiration, take a look through the ideas submitted by both manufacturers and your peers. The pretzel bread trend is running rampant, and I personally love it! It seems like no matter where I go nowadays, from chains such as Wendy's, Sonic, Buffalo Wild Wings, and Chili's to local restaurants looking to catch the pretzel wave, everyone is trying to put a new "twist" on an old favorite. So, being that we're in the pizza industry, I contacted the man who I felt could bring pretzels to pizza, Tom "The Dough Doctor" Lehmann. I asked if he'd be willing to humor me a little with a pretzel crust for pizza. To my surprise and delight, he said that he and Jeff Zeak had already been experimenting with pretzel pizza crusts over at the American Institute of Baking. It was only a matter of days before he sent me the following instructions and photos that outline how to make your very own pretzel pizza crust! If you try this, please let me know and send photos to Liz@PMQ.com. We would love to share them in the magazine. Plus, if you're close enough, I'd like to come over and try the pizza, preferably with a side of cheese sauce for dipping. 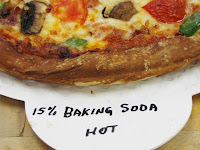 For this experiment, we conducted trials using a standard pizza crust formula, changing it to a pretzel crust by brushing the edge of the formed skin with both sodium hydroxide (see warning about sodium hydroxide below) and sodium bicarbonate (baking soda) solutions immediately before baking. We made 2% sodium hydroxide solution and heated it to 190F/88C before brushing it onto the edge of the dressed pizza skin. The edge was then lightly sprinkled with kosher salt (this helps it taste like a pretzel) and the pizza was taken directly to the oven for baking. The pizza was baked in an air impingement oven the same way we bake our regular pizzas. (Note: If you value your baking screens, disks or pans, don’t use them in this highly caustic application, instead use an ovenable baking tray designed for take and bake pizzas or a piece of baking parchment paper). 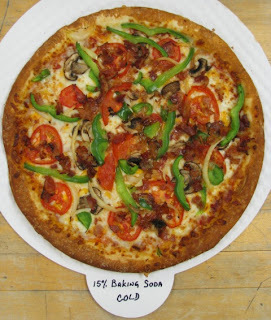 Whichever you opt to use, be sure to use a spray release oil on it before you place the dough onto it. 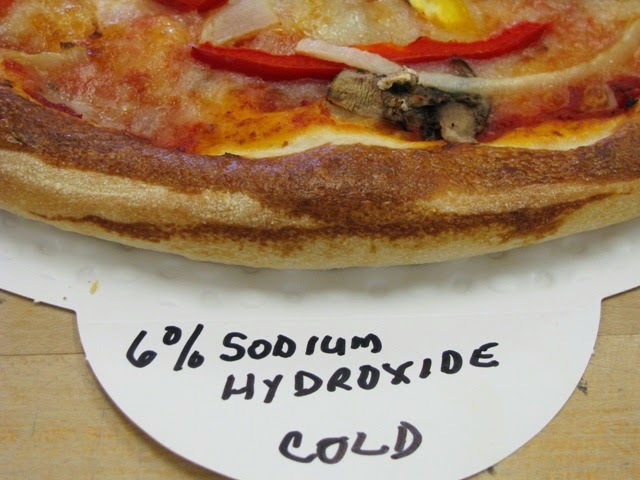 Failure to do this will most likely result in the edge of the dough, where the alkali solution has been applied, sticking to the paper or tray. The resulting crusts had a deep, pretzel like mahogany color with recognized pretzel flavor. We also tried the sodium hydroxide at 6% solution using cold water and applied the solution cold. This also gave a very acceptable crust color and flavor. I must caution you that both of these solutions are highly caustic and extreme care must be exercised in making the solutions and applying them onto the crust. At the very least, a respiration mask, eye protection (goggles) and plastic gloves should be worn when making or handling these solutions. 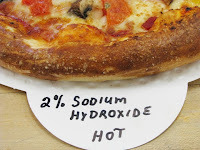 As a safer alternative to the sodium hydroxide, we also used a 15% solution of sodium bicarbonate (baking soda) and applied it to the dough both hot (190F/88C) and cold (room temperature/ambient). These solutions are much safer to work with and handle, but we found that the color and flavor were not quite as good as that from the sodium hydroxide solutions. The color with the baking soda was more dark brown than mahogany in color, and the flavor, while good, was not as readily identified as that of a pretzel. We did not see any significant advantage to using this soda solution hot over the cold preparation, so we would recommend using it cold/ambient for safer handling. We thought that this might be a good approach to use if the crust were to be brushed with melted, clarified butter immediately after baking for something more of a gourmet pretzel presentation. Our testers found the salted crust to be very acceptable on all crusts regardless of which solution was used. Whatever you decide to use for the caustic solution, be sure to follow all precautionary measures. If you are looking for the best pretzel flavor, we think that a salt topping works best, but other toppings can be used. Be sure to use a sanitary, plastic bristle brush to apply the caustic as it can potentially destroy a natural bristle brush. Lastly, when forming your dough for the pretzel crust, we achieved the best appearance and presentation when we formed the dough with raised or beaded edge as opposed to a flat or non-raised edge. WARNING: Historically, sodium hydroxide, commonly known as “lye” is used to make the alkali solution, but there are some very real risks associated with using a sodium hydroxide solution. It can cause caustic burns if you get it onto your skin, or it can cause severe eye injury or even blindness if one were to get it into their eyes. Use extreme caution.